Over the last two decades, there have been growing concerns over emerging contaminants from a group of manmade chemicals known of per- and poly-fluorinated alkyl substances (PFAS). These compounds were often used in fire-fighting foam and a wide variety of commercial and industrial applications. PFAS are persistent and resist degradation in the environment. An increase in drinking water contamination due to possible PFAS releases from sites around the country has led the EPA to issue human health advisory levels, and several individual states have implemented groundwater contaminant levels. OTIE staff, in partnership with the Air Force and US Army Corps of Engineers, are performing site inspections of aqueous film-forming foam (AFFF) at several US Air Force installations in US EPA Regions 6 and 9. As a leader in the investigation and remediation of PFAS contamination, Oscar Martinez has provided briefings on PFAS for groups such as the Alamo Air Waste Management Association, at SAME luncheons in Guam and Savannah, and for government customers from Japan to Savannah. Topics covered range from lessons learned in sampling these ubiquitous compounds, analytical laboratory management and requirements, trending regulatory guidance, investigative-derived waste management, and remediation or treatment technologies. Oscar is a Senior Program Chemist and Project Manager in OTIE’s San Antonio office and has over 26 years of professional experience. 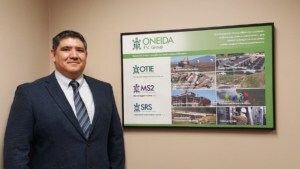 He is the project manager for OTIE’s PFAS-related site inspections contract at multiple US Air Force installations and he has been the Program Chemist for the PFAS program for the past four years.